Find the best Pure Adventures Europe trips. TourRadar offers 30 tours from Europe through 9 countries. The tours span across 6 day to 8 day itinerary with prices ranging between $180 to $401 per day. "The Dolomite trip is outstanding and is as advertised. Although a net downhill there..."
"We could not have been more pleased with this self-guided gastronomic tour of Costa..."
"Wonderful! 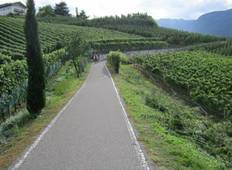 The biking was challenging, but the trip was well organized and beautiful." "The trip was our second perfect trip with Pure Adventures, so we're starting to talk..."
"We had a wonderful time on our Puglia 7 day adventure. Everything was perfect - the..."
"We loved our tour! The route/itinerary were absolutely fantastic. Minor feedback..."
"Enrico was our guide, and was early, and very thorough on all facets of the Tuscany..."
"Patrick was awesome! He was very helpful with a last minute change to our plans and..."
"Trip far exceeded my expectations. The main reason was the additional service we..."
"We had a great experience from start to finish with Pure Adventures. 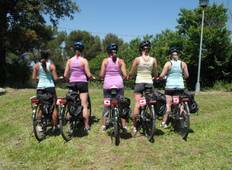 Everything went..."
"We completely LOVED our Pure Adventures cycling trip. The routes were fabulous --..."